When it comes to fragrance, skincare, shaving and hair care, it’s often the case that men love everything, or they love nothing. For some guys beauty products are still a little taboo, while others have a more impressive grooming regime than many of their female counterparts! Men sometimes need a push when it comes to skincare regimes – so now is the time to ‘upgrade’ them! Invest in a luxury skincare brand, and encourage them to keep up the routine. 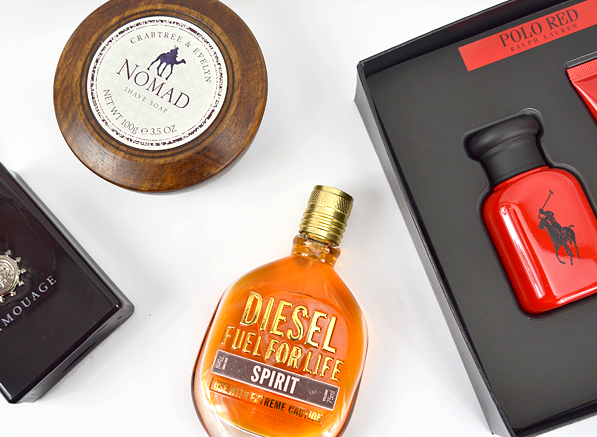 Gift sets are a great way to introduce your man to a new product or brand. Take a look – there are more than likely sets available for his favourite fragrance, shaving products and skincare regime. If there isn’t a gift set available – create one! Make a hamper full of all of his favourite grooming products, and a few complimenting ones that he may not have tried before. If he’s particularly well groomed, take a look at some of the male cosmetics lines that are available. Male-specific bronzers, balms and brow groomers are a great gift for those who are fed up of buying their grooming products from the women’s aisles. If the man you’re buying for is a lover of all things traditional, consider giving him a shaving brush and stand. They’re still widely available, as are their corresponding shave soaps and creams. A bath and shower gift set is a great present, especially if you’re buying from a premium brand that will offer your recipient a little touch of luxury. Stick to really fresh and clean fragrances, unless you’re sure of a scent that he likes. Let yourself be swayed by products that come with free gifts such as such as bags, umbrella or caps; they’ll increase the value of the gift and let you give even more for the same expenditure. Take note of his favourite fragrance, and have a look to see whether there’s a matching shower gel or deodorant in the range. Not only will you get something you know they like, but layering the fragrance in this way will make the fragrance smell even better (and last longer). An aftershave splash in his favourite fragrance is also a great idea, as it will condition the face post-shave whilst imparting a degree of his signature scent. This entry was posted on Wednesday, July 27th, 2011 at 2:21 pm and is filed under Gifts, Gifts, Men, Shopping Guides. You can follow any responses to this entry through the RSS 2.0 feed. You can skip to the end and leave a response. Pinging is currently not allowed.